A new blood test from Roche and Foundation Medicine could help determine which patients respond to immunotherapies. The test developed with the US-based genetic testing specialist could be significant because, although potent, it is difficult to predict which patients will respond to immunotherapies, which are setting new care standards in some types of tumours. This and the tough side-effects associated with immunotherapies have led to some unpleasant surprises where trials have produced unexpected failures, and Roche hopes that testing Tumour Mutation Burden (TMB) will more accurately predict where immunotherapies will succeed. Roche’s PD-L1 immunotherapy, Tecentriq (atezolizumab) ran into trouble earlier this year after phase 3 data failed to confirm the benefit seen in earlier bladder cancer trials. TMB is a clinical marker that measures the number of mutations within a tumour genome, and the new data show for the first time that a blood-based test can measure this with a high degree of precision and accuracy. TMB has been found to be an indicator of likelihood of progression-free survival (PFS) benefit from immunotherapies when used alone (monotherapy) in patients with non-small cell lung cancer (NSCLC). Until now TMB could only be measured using an invasive tumour biopsy, and a blood test could extend tests to patients unable to undergo these procedures, or where tissue is unavailable or of insufficient size to evaluate. The blood TMB (bTMB) biomarker study being presented at the European Society of Medical Oncology (ESMO) conference was conducted using 794 plasma samples from the pivotal phase 2 POPLAR and phase 3 OAK Tecentriq studies. The purpose of the analysis was to collect initial, retrospective evidence of an association between bTMB and Tecentriq activity. These early data will inform ongoing and future prospective research to better understand the role of both TMB and bTMB as it relates to treatment with cancer immunotherapy. 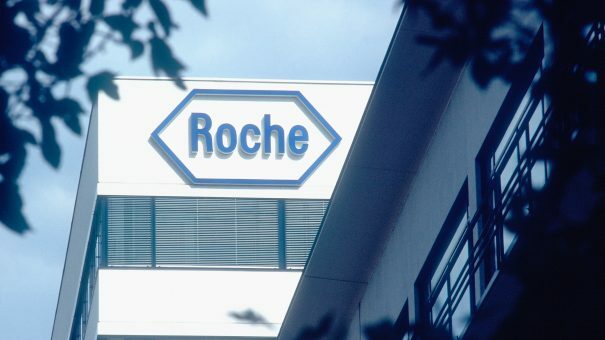 Roche has now begun two more trials determining whether the test can predict which previously untreated lung cancer patients will respond to Tecentriq, or its other drug Alecensa (alectinib).